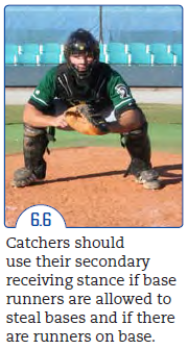 At Mosquito and higher divisions especially, the position of catcher is critically important to a team’s success. Catchers are considered the anchor on the field, and besides the pitcher, they are the next most important player on defense. For instance, a great team without a skilled catcher suddenly becomes very average. Great catchers are athletic, physically and mentally tough, smart, and focused. They inherit a certain amount of leadership from wearing the gear and getting behind the plate. Therefore, most catchers embrace their leadership role and set the winning tone for their team by playing the game hard. A catcher contributes leadership by maintaining the pace of the game. He keeps his pitcher and defense focused regardless of the score or situation. He constantly reminds his teammates of potential scenarios, including the outs, number of runners on base, possible team bunt defenses, possible first and third defenses, and he hustles to back up every infield throw to first base when there is no base runner in scoring position. A fundamental skilled catcher who can receive pitches with body control and precision can actually improve his pitcher’s odds of umpires calling borderline pitches as strikes. In addition, if the catcher is efficient at blocking, he indirectly boosts the confidence of his pitcher, who will feel comfortable baiting the hitter to swing at a changeup or breaking pitch in the dirt with a runner on third base. 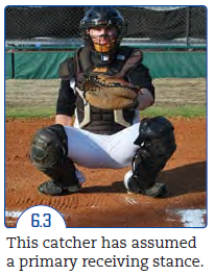 Other important attributes for catchers to possess are an above-average arm, quick feet, quick release, and an accurate delivery of their throws to bases. These help shut down the aggressive base running of opponents who may try to steal second or third base on the pitcher. Catchers must use a variety of stances to effectively do their job behind the plate. Each delivery of a pitch must first start with a sign, which is given from the catcher in his “giving signs stance.” This lets the pitcher know which pitch to throw and where it should be located. 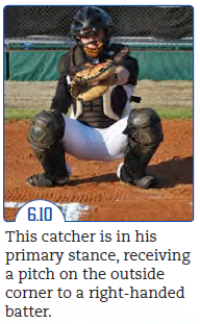 When there are no runners on base, a catcher does not have to be quite as concerned about blocking pitches, so he can create his “primary stance,” which is more relaxed. However, when base runners are aboard or there is a full count on the batter, he implements his “secondary stance.” In this position, he is more prepared to quickly react to a pitch in the dirt or to move his feet in preparation to throw out a base runner attempting to steal a base. No matter what the game situation is, a catcher will be in one of three specific stances where he must create proper distance from the hitter. To establish that distance, the catcher theoretically should be able to reach out and almost touch the back knee of the batter. If the batter moves to the front of the batter’s box, the catcher should scoot up to maintain this relationship. The same is true if the batter moves to the back of the batter’s box. Signals tell the pitcher what kind of pitch to throw and where it should be delivered. 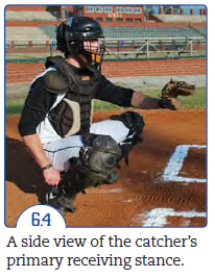 The catcher should centre his body behind home plate, and narrow the distance between his knees so only the pitcher and middle infielders can see his signals. 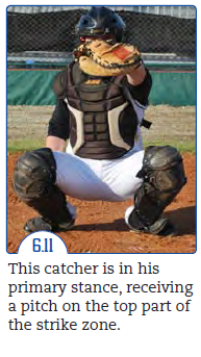 The catcher’s body should be tall or erect (not slouched over), and his body language should exude confidence. His right forearm should be on top of his right thigh, and the right hand should be deep between his legs to give the signals. 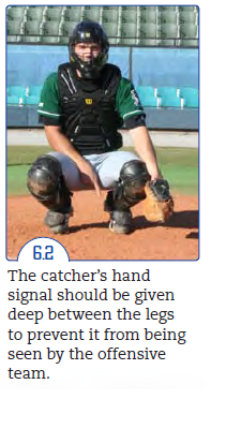 The catcher’s fingers should not extend where they can be seen from behind or possibly from the side. His mitt should be open and resting next to his left shin (between the left knee and left foot) to prevent the third base coach from peering in and stealing the pitch signs. A catcher should not use a simple sign system when a base runner is on second base. 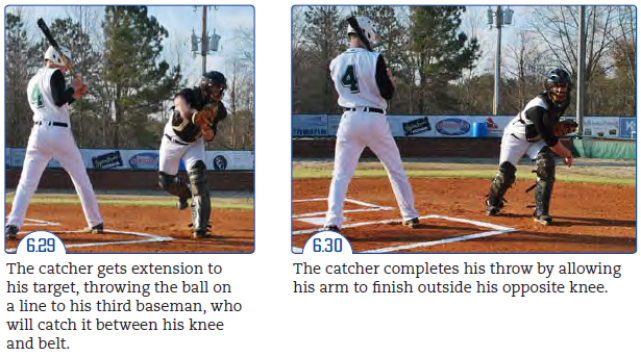 This allows the offensive player to see the catcher’s signal and the location he wants the pitch thrown, and now the runner can tip off the batter via his own signal as to what pitch he should expect. When playing night games, a catch may have to use body signals or touches so the pitcher and middle infielders know which pitch is going to be thrown. 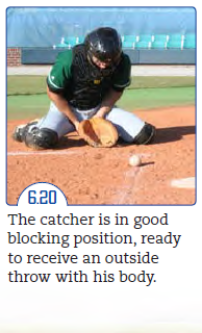 The catcher must periodically watch the hitter to make sure he is not peeking back to steal the signal for the pitch. When there is a runner on first base, a catcher should bring his knees closer together when giving signs so the base runner cannot steal the sign and relay it to the batter or use that information to attempt a steal on an off-speed pitch. 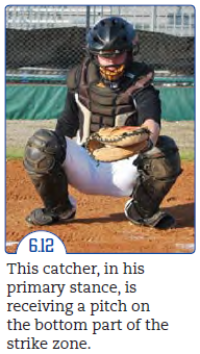 This stance is used by catchers when there are no base runners and less than two strikes on the batter because it is not critical that they perfectly block the ball or throw out any base-stealers. 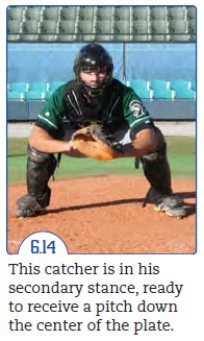 The catcher should create his primary receiving stance with his knees bent, feet outside the knees, toes pointed slightly out, and weight on the inside of the feet. Buttocks is down below knee level. He will be able to sink deep into his crouch with his glove-side elbow just beyond his knees to give the pitcher a good target. The fingertips of his should be close to a forty-five degree angle towards the pitcher. This also allows the catcher to receive the ball in front of his body with a relaxed arm and wrist. 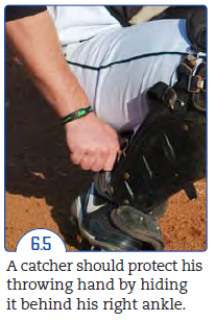 It is critical that every catcher learns to protect his throwing hand from being hit by a stray baseball by hiding it behind his right ankle. If a catcher does not pay attention to how far he is setting up from the batter, he may end up too far away. This gives borderline pitches a chance to appear to creep out of the strike zone, and they may cost his team a few close calls. If the catcher does not setup his target far enough out front, his glove-side elbow may get trapped between his knees when he tries to receive a pitch to his right or his left. 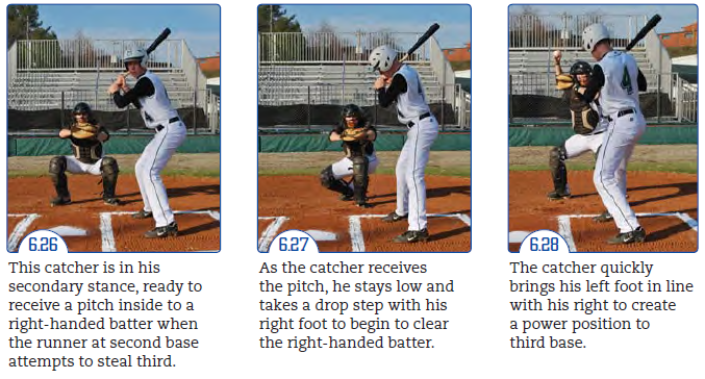 When there are two strikes on a batter, or runners on base, the catcher should assume his secondary receiving stance. This will give him the greatest mobility, quickness, and range while blocking a pitch in the dirt, transitioning to throw a base when a runner is stealing, or attempting a pick-off. The catcher should slightly stagger his feet so his right foot is a little bit behind his glove-side foot (the toes on his right foot will be lined up with his left instep). His legs should be spread wider apart than shoulder-width, with his weight slightly forward, but not far enough to bring the heel of his cleats off the clay. He should slightly raise his buttocks to bring his thighs close to parallel to the ground, and his upper body should stay tall and not slouch. To be in a better position to make a quick transition to throw the ball, the catcher should make a fist with the throwing hand and place it a safe distance directly behind his glove. This will also help protect it from a foul tip. Catchers should anticipate a ball in the dirt or a runner stealing a base so they will react with precision to execute the play. 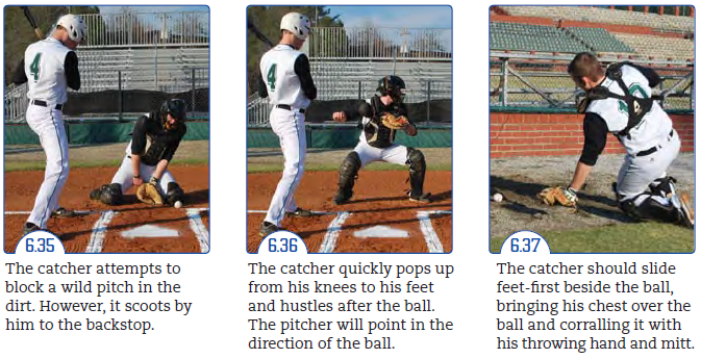 Whether a catcher is using a primary or secondary receiving stance, he should implement correct receiving mechanics to give the umpire the best look at the pitch. Receiving is considered an art that can be learned and polished by catchers. The overall goal of a catcher is to receive the pitch in the strike zone as cleanly and with as little body movement as possible. When the catcher is setup on the centre of the plate and receives a pitch down the middle, he should simply catch it cleanly. This is an obvious strike so he can either “stick” the ball by keeping his wrist firm, or he can choose to slightly give with the ball in towards his chest, whichever is more comfortable. A catcher should setup quietly and late, just before the pitcher starts his delivery, for the pitch he called. This keeps the batter from being able to determine the suspected location of the pitch. Catchers can also pat their glove inside and then move outside every once in a while to deceive the batter. A catcher can create softer hands by wearing his glove more loosely. Ideally his glove should fit in a relaxed, semi-loose manner with the palm of the hand slightly exposed. His hand and fingers should form a “U” shape in the glove. A catcher should learn the home plate umpire’s first and last name, and ask if he prefers to be called by his first or last name. The catcher should use his name in a polite manner at appropriate times throughout the game. When the catcher is setup on the corner of the plate or just off the corner, and a pitch is thrown close to target, the catcher should attempt to catch the outer half of the baseball as close to the plate as possible. He should not let the ball pull his glove backwards or out of the strike zone. 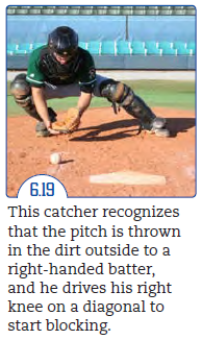 When a catcher “sticks” (moves his glove forward to meet the ball and catch it firmly) a borderline pitch, he should not over exaggerate the “hold” (freezing the glove motionless for the umpire to get an extended look at where the ball was caught) if the umpire calls it a ball. This will frustrate an umpire who may feel that the catcher is trying to show him up. Therefore, just give the umpire a good look at the pitch when it is caught and then throw the ball back to the pitcher. When the catcher receives a pitch that is up in the strike zone, he should try to arrive early at the spot where he will catch the ball so he can attempt to receive the top half of it. He does not want the momentum of his glove moving upwards to take the pitch out of the strike zone. When he catches a pitch delivered in the bottom part of the strike zone, he should attempt to receive the ball with his glove fingers above the ball instead of turning the fingers towards the ground and the glove facing upwards. When the catcher sets up to receive a pitch in a specific location of the strike zone and it is delivered to a different location, he should recognize this difference while the ball is in flight to the plate. Then, he should gently “sway” or “rock” in the direction of the pitch to get his eyes and body behind the ball when receiving it instead of lazily reaching for the catch at the last second. If the catcher knows a pitch is a definite ball, he should not try to pull the ball back into the strike zone area after catching it. This incorrect movement will be obvious to an umpire and insult his integrity. When a catcher receives an obvious ball, he should immediately remove it from his glove and throw it back to the pitcher. The catcher should never become frustrated with an umpire’s strike zone and start to show negative body language and/or verbally react to his calls. This can cause the umpire to “squeeze” or tighten the strike zone. Part of a catcher’s responsibility is to learn how to effectively handle pitches that are thrown in the dirt or bounce before they get to the plate. It takes mental and physical toughness combined with anticipation, quickness, and proper technique to be consistent with this critical catching skill. Catchers must be drilled on a regular basis to keep their instincts and techniques sharp. Remember, a player who can handle all reasonable pitches in the dirt is a tremendous asset to his team, and this skill alone can win games. Catchers should be taught how to react correctly to a baseball pitched in the dirt directly in front of them. 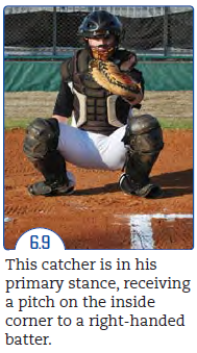 The catcher should instinctively fall forward to his knees and tuck his chin into his chest protector while watching the ball bounce into his chest. In essence, the catcher is following his glove to the ground. This decreases the relative angle of the ball that he is trying to stop with his body, and prevents the ball from getting by him, which could result in a passed ball or wild pitch. The catcher should quickly fill the 5-hole with a wide-opened glove, while protecting his bare hand from being hit by the baseball by placing it completely behind the glove. He should simultaneously round his shoulders and relax to soften the impact and reduce the rebounding effect. The goal is to let the chest protector cushion the impact of the ball so that it falls in front of the catcher. Once the ball is blocked, he should quickly get to his feet and retrieve the ball with his throwing hand. This is especially true if there are runners on base. Some catchers have the tendency to jump into the air slightly before dropping to their knees. This should be avoided because it creates space for the ball to pass underneath the player. This technique requires more coordination, confidence, and body control than the centre block. As soon as the catcher determines that the ball will bounce in the dirt to his side, he must drive down the knee closest to the ball at an angle, while simultaneously pushing with the opposite foot. 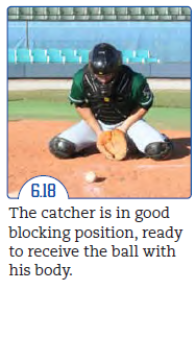 This action swings the catcher’s body around the ball while reducing the angle of the block. He should lean forward, tuck his chin into his chest protector, and curl his shoulders in to form a soft pillow that will absorb the impact of the ball and keep it in front of him. 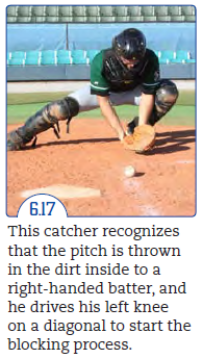 If the catcher recognizes that the pitch will be in the dirt, he should not try to scoop the ball or reach out to catch it with his glove, instead of blocking it with his body. This will result in many passed balls and wild pitches. When a pitchers throws breaking pitches, the baseballs typically have spin that causes them to kick in one direction or the other, unlike a fastball that tends to take a true hop. 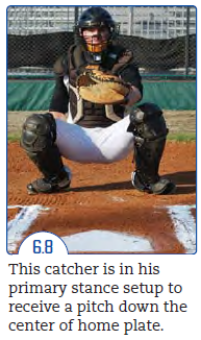 Therefore, a catcher must take this spin into account when he calls for a curveball or slider to be delivered. At the Mosquito level, runners can steal second and third base after the ball is pitched. In Peewee and above, base runners are free to steal any base at any time. Bringing the glove thumb to the right shoulder as the catcher makes a quick transition to a four-seam grip. Getting the upper body into a power position with the throwing hand near the right ear. Taking his chin to the target. Simulating throwing down a narrow hallway to his intended target. When a runner is attempting to steal second base, the catcher can choose between a couple of different options for his footwork. Regardless of the choice, it is critical that he transitions his body to a power position as quickly and efficiently as possible. When a pitch is received somewhere between the catcher’s shoulders or slightly off to his left, he should use footwork similar to a shortstop who is quickly trying to deliver the ball to first base. When the base runner is stealing, the catch should lean forward to gain some momentum into his throw. Just as the ball is about to impact the catcher’s glove, he should begin to move his body into a power position by “clicking his heels” or replacing his feet. In this case, that means the right foot moves towards the left foot as the left foot simultaneously moves towards second base. After the ball is released, the catcher should continue his momentum towards the base for a step or two. If a catcher rises up while catching the ball to make his throw to a base, he wastes valuable time and takes energy away from the direction of the throw. If a catcher does not have the arm strength to throw to second base, he should not compensate by throwing the ball in an arc in order for it to reach the base. This takes too much time and is rarely effective. 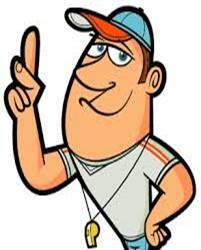 It is a fact that the baseball travels faster than any human being. Therefore, a catcher should never run a few steps before throwing the ball in an attempt to throw it harder. The same principle applies to players who try to wind up in order to throw the ball as hard as possible to the base. This is all a waste of time. The key is to get the ball out of the throwing hand and on its way to its destination as quickly as possible. Catchers who have the quickest feet, transition, and release will typically have the best pop times. Pop time is the time taken from the instant a pitch hits a catcher’s glove to the moment it strikes the glove of the middle infielder at second base. However, when you have these characteristics and an above-average arm, you have a special combination that often results in superior pop times. To give the fielder the best chance of handling the throw, it is acceptable for the catcher to throw a long hop to second base. When a catcher has the arm strength to throw all the way to second base, he should attempt to throw the ball in a straight line in the air (without taking a bounce) so his teammate can catch it somewhere between knee high and belt high. This gives the ball extra carry and provides a margin for error if the throw is a little too high or low. The T-step is another footwork option for catchers throwing to second base. It can be used on any pitch location within reason. When the catcher is about to receive the pitch, he can gain some momentum to second base by taking a short, quick step with his right foot straight to second base while turning the same foot so that it is parallel to the front of the plate. This will rotate his body into a power position directly in line to second base. It has been said, and most good base runners agree, that stealing third base is easier than stealing second base. This is true for a couple of reasons. First, the base runner can take a bigger lead and often can get movement towards third base prior to actually starting to run. Second, most pitchers and middle infielders do a poor job holding the runner close at second base. 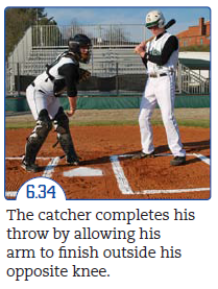 Therefore, catchers must be extremely efficient and accurate when throwing out a base runner attempting to steal third. The good news is the catcher’s throw has less distance to travel than a throw to second base. When a runner is attempting to steal third base, catchers typically choose to use their “clear behind” footwork to give them the space needed to throw behind a right-handed batter. If a left-handed batter is hitting, the catcher can simply use his “replace” footwork. 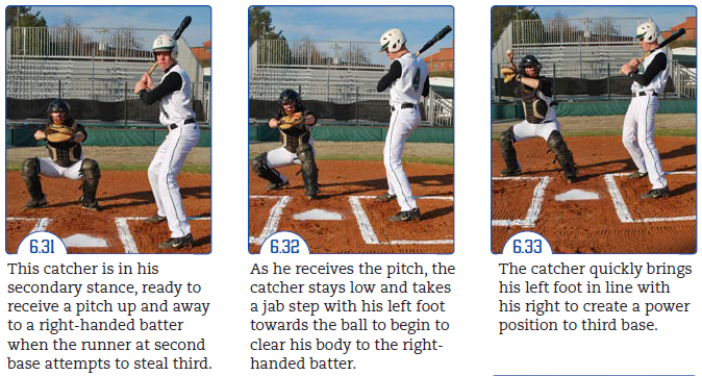 To effectively clear behind the batter, the catcher will drop his right foot back behind him as he receives the pitch. His left foot will follow to move him into a power position to throw to third. Once the throw is released, the catcher should continue his momentum towards the base for a step or two. A catcher should not attempt to throw a runner out at third base by moving straight through the batter in the batter’s box. In fact, the batter has a right to stand there as long as he intentionally does not attempt to get in the catcher’s way. The catcher must use proper footwork to work around the batter as he makes his throw. If it is apparent that the base is already stolen, the catcher should not throw for any reason, especially not to show off his arm. When there is no chance of getting an out on a play, only bad things can happen from an unnecessary throw. If a runner is attempting to steal third base, and the pitch takes the catcher to the right side of the plate or towards the left-handed batter’s box, the catcher should use the jab-step footwork. The catcher will take a step with his left foot to meet the pitch, and then bring his right foot in line to create a power position to third base. This produces distance from the front side of the right of the right-handed batter so that the catcher has a clear path to throw to third. Once the throw is made, the catcher should continue his momentum towards the base for a step or two. Some catchers prefer to use alternate footwork to clear the batter. They feel more comfortable stepping towards a pitch on the outer half of the plate with their right foot first, and then bringing their left foot into a power position to throw to third base. Either way is acceptable. Catchers must learn how to efficiently retrieve a passed ball (a ball that gets past the catcher) or a wild pitch. This is especially the case if there is a runner at third base. Learning to quickly locate the ball and track it down can make the difference between an out at the plate or a run for the other team. Once the catcher recognizes that the ball has gotten past him, he should quickly spring to his feet, remove his mask, and run full speed after it. 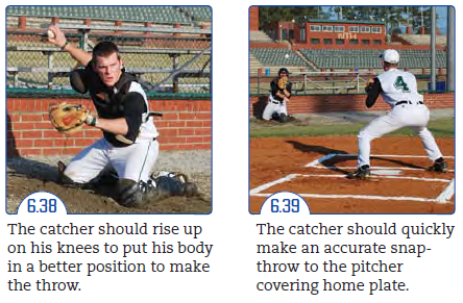 The pitcher should help the catcher locate the ball by pointing in its direction as he is running to cover the plate. The pitcher should also shout “third” or “first” to indicate the direction of the ball at the backstop. The catcher should toss his mask away from the plate and slide feet-first on this shin guards to the right side of the ball, field the ball, and throw, all in one motion, to the pitcher for the tag. If the ball is still rolling or moving, the catcher should use his glove to corral the ball into his throwing hand. If the ball has come to a complete stop, he should pick it up with his bare hand. If a catcher runs after the ball and picks it up with his back to the plate, he will waste significant time and probably lose the opportunity of getting the base runner out at the plate. If a ball gets past the catcher with a base runner on first, it is dangerous if he chooses to lazily trot after the ball in frustration. Often an aggressive base runner with some speed can go from first to third base if there is a large amount of foul territory or space from the plate to the backstop. The catcher should attempt to throw the ball belt-high to the pitcher to allow for margin of error. If he tries to throw the ball exactly where the tag should be, he may throw the ball into the ground just before it reaches the pitcher’s glove, making it very difficult to catch. If there are runners aboard other than the one at third base, and the catcher retrieves a passed ball, he must make a split-second decision whether to throw to the plate or limit the damage holding onto the ball. If he has a legitimate shot at the runner at the plate, he should release a snap throw to his pitcher covering the plate. If he senses that the runner heading home will be safe, he should hold the ball to prevent an unnecessary throw that could end up being mishandled. At the Mosquito level and above, catchers must become more comfortable and increase their confidence executing the catch of a pop-up around home plate. This simply may be the most difficult play in baseball. This is especially true when the ball goes up and down directly over home plate or a few feet out in front of the plate. Understanding the concept of how the ball spins off a hitter’s bat can be helpful when attempting to make this very challenging play. 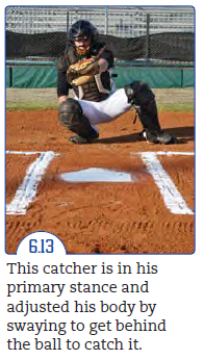 In addition, understanding the flight of the ball when it is popped up directly behind the plate, or even in front of the plate, will allow that catcher to develop a game plan to track the ball for the catch. A right-handed batter typically fouls the ball towards the first-base side of the field from a spot directly behind home plate all the way down the right field line. A left-handed batter is exactly the opposite. 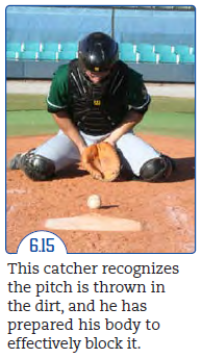 Therefore, a catcher should immediately remove his mask and look in the proper direction when the ball is hit upwards. A ball that is popped up directly behind or over the plate will have tremendous backspin. This will cause the ball to fly in the general direction of the stands (behind home plate), and then circle back towards the plate. If the ball literally goes straight up off the bat, it has the potential to end up at the pitcher’s mound. A catcher must first accurately locate the ball in the air to eventually make the play. The catcher should never give up on a pop-up around the plate, thinking someone else will take it from him. Catchers must be aware of the wind direction because it will play tricks with the ball while it is in flight. Once the ball is located, the catcher must strategically track it down for the catch. Typically, a catcher will turn his back to the fair territory to make the play. When the pop-up has reached its peak and has started to descend, the catcher should call for the ball to let other know he is going to make the play. When the catcher is certain he has a correct path to the ball, he should discard his mask by tossing it out of the way, off to his side. If possible, the catcher should catch the pop-up directly in front of his face. However, if he misreads the ball and is facing the field of play, he should attempt to catch the ball about belt-high with the palm of his glove facing upwards. If a catcher runs too hard after a pop fly directly behind the plate, he may actually overrun the catch, if he is not careful. The pitcher should point at the pop-up in the air to help the catcher find the ball. When the pop-up is going to land right beside a backstop or dugout, and the catcher is on the run to get the play, she should slide feet-first while making the catch. This protects him from colliding face-first with any objects. At Mosquito level and above, catchers must be more skilled at fielding bunts than younger players. When winning becomes the primary focus of playing, coaches will ask their players to sacrifice bunt or bunt for a hit to move base runners into scoring position. There is a specific technique used to field a bunt and throw to third, second, or first base. When the batter makes a movement to indicate he is going to bunt, the catcher should shout “bunt, bunt, bunt” to alert his teammates of their defensive responsibilities. No matter where the ball is headed on the ground, the catcher should aggressively attack it, never assuming another fielder will make the play. If a catcher is called off by a teammate from making the play, he should peel off and get out of the fielder’s way. When the ball is bunted towards the first-base side, the catcher should quickly move to the ball. He should approach it from the left side and get his body over the ball. If the ball is still rolling, he should field it by bringing his glove and throwing hand together to secure it. If the ball is stopped, he should retrieve it with his bare hand. Once the ball is secured, he should take a quick shuffle to get his momentum and direction towards the base of his choice, and then throw the ball. 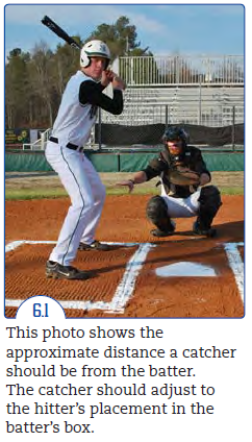 If the ball ends up near the first base line, the catcher must field the ball and then clear himself by taking a step to the left or the right to avoid hitting the base runner with the ball. When the ball is bunted in the general direction of third base, the catcher should quickly move to the ball, approaching it from the catcher’s right side. This will put his back towards first base. 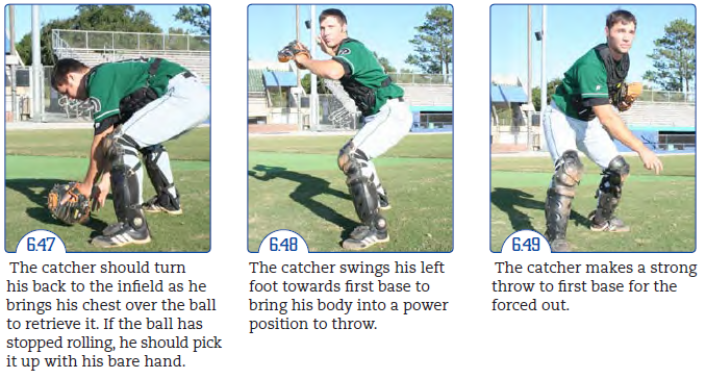 If the ball is still moving, the catcher must place his left foot beside the ball to give his body room to secure the ball with his glove and throwing hand. The catcher must quickly pivot counterclockwise and throw to first base.